Kentucky guitar slinger Mike Shouse looks like a cross between vocalist Rob Halford and guitarist Joe Satriani; thankfully he plays more like the latter and definitely doesn't sing. 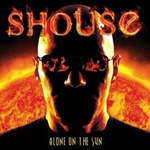 Reflecting influences which include Gilbert, Petrucci, Vai, Wylde, Vaughn and many others, Shouse has been at his craft for 20 years, and on his second independent release 'Alone On The Sun,' it certainly shows. Regarding the latter, realizing he's from down south Kentucky way, you would expect some of those southern influences in his music. It rises on 'Dead In Memphis,' 'Don't Remember Me', and on the best track, the reworking of the classic folk/bluegrass number, 'Man Of Constant Sorrow' (which dates back to 1913 and has been recorded by the likes of Bob Dylan and Rod Stewart). Additional positives would include the outstanding supporting cast Shouse recruited as backup, with my kudos in particular to drummers Charlie Zeleny and Diego 'Grom' Meraviglia and bassist Kyle Honea. The only significant downsides were in the production which was mostly uneven and even horrible at times as on the opening cut 'Bionic.' If it were not for the promise of Shouse's guitar work ahead, I may have not made it past the opening track. Overall, Mike Shouse's 'Alone On The Sun' is a solid expression of his experience, skill, and style as a guitarist. His compositions, though seemingly more of the same from another guitar virtuoso, demonstrate his ability to craft a complete melodic composition involving all participants and still soar on his guitar at the same time. Recommended! Mike Shouse's 'Alone On The Sun' is a solid expression of his experience, skill, and style as a guitarist. His compositions, though seemingly more of the same from another guitar virtuoso, demonstrate his ability to craft a complete melodic composition involving all participants and still soar on his guitar at the same time.